This leaflet outlines the voting measures discussed at the April 1914 meeting of the Kansas Good Citizenship League. Women in Kansas won the right to vote in 1912, and with their new voting privileges they hoped to change Kansas society for the better. Among other things, Kansas women were interested in ensuring that all children received equal educational opportunities and in creating a division of child hygiene in the department of the State Board of Health. Most of their concerns revolved around improving the rights of women and children. 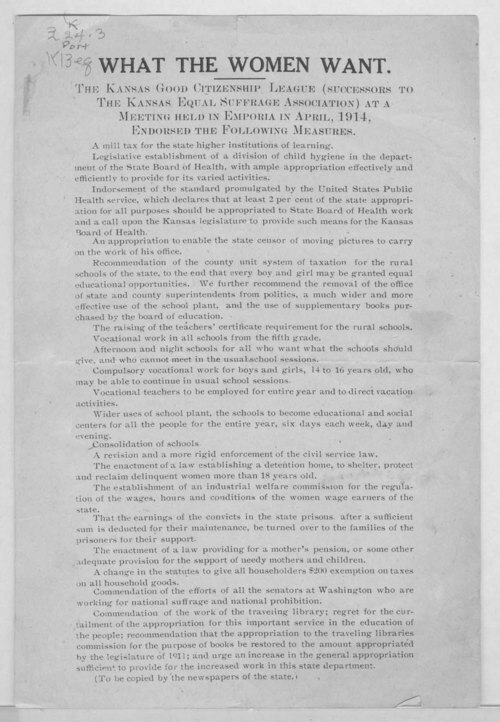 This source is particularly useful as an example of how Kansas women, now that they had full suffrage, were focused on improving education and protecting the rights of mothers and their children. It could serve as a concluding document to tie up class discussion of the suffrage movement.